Hmm, this has started badly. How can I bash gays now? Aha! Jesus told us to love our enemies! That means I can say that we hate them and should murder them! Wait...? Are you seriously suggesting that I have to love everyone? That's a tad disappointing. So by not loving other human beings, we are not loving God? That is utter gibberish, let me find that verse which explicitly states God hates homosexuals. By making people become depressed, oppressed, repressed and making them turn away from their faith, I am doing no ill to my neighbour therefore my love fulfils the law. The Bible doesn't really talk about love anyway, it's only mentioned about 730 times which is pretty inadequate. And have patience, I'm still trying to find that verse in the book of God Hates. Jesus loved the Pharisees. Jesus said for us to love everyone and for some reason he didn't go, "except" afterwards. 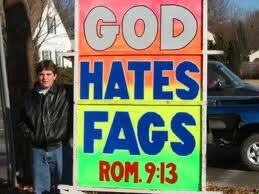 My search for the verse that states "God hates fags" is going badly so I'm going to make it up. If you want...Click on “dashboard” on the top right of you main blog…then click on “add a gadget” on the left side column…scroll down and click on “Follow” widget and follow directions. There is a "follow by email" wedgit you will come to first, but...think of what it does to a email folder if one has a couple thousand followers. I've read this post three times now...I love your sense of sarcasim and can see that I'm going to enjoy being a follower of yours. Keep it coming. Thank you for the gadget tip, still getting used to this blogging lark so the help is appreciated! I'm glad you enjoyed the piece, means a lot. I'm afraid sarcasm seems to be an inbuilt function in the English (advocating a stereotype here for once). Thank you for your powerful testimony. I'll post again in 2 weeks. No problem. If what happened in my past can do good in the future, it'll make it worthwhile. It's a powerful combination. I'm glad to hear you're not a kidnapper, alas, that is something I cannot claim. Thanks for your comment, it actually made me laugh which not many people can do with the written word! Have a great day and God bless. Just started following you, I have a blog too if you want to check it out. Couldn't agree more, God is love.